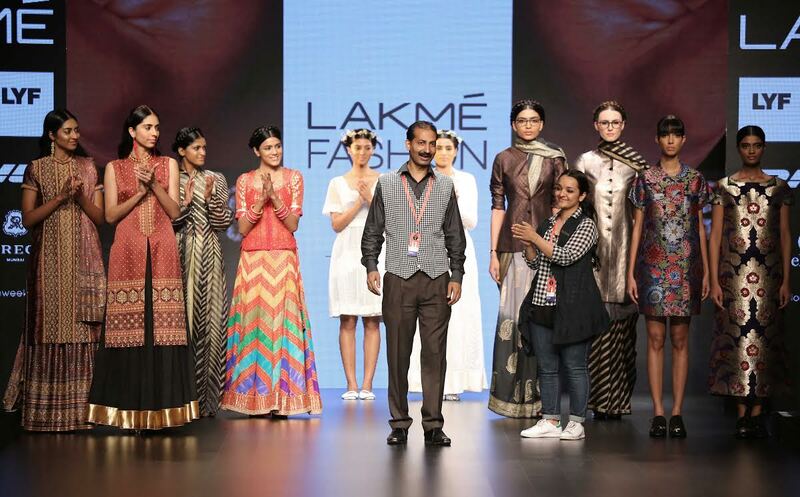 The Walking Hand-in-Hand’ innovative presentation featured India’s five top designers who teamed up with the best craftsmen and weavers who are all are experts in their particular genre and displayed creations that combined designer and craft skills. Chikankari came alive on the ramp under the creative guidance of Aneeth Arora. Master craftsman, Jakir Hussain Mondol worked his magic on the pretty summer dresses, cool blouses, layered minis, softly embroidered long-sleeved covers, delicately embellished midis, skirts and gowns in shades of white and pale blue/grey. It was a perfect summer offering for days when the mercury rises. Giving Kinkhab his amazing touches, designer Rajesh Pratap Singh worked with master weaver, Haseem Muhammad for his striking collection of formal western wear. Using the rich golden brocades with glorious floral weaves, Rajesh presented comfy culottes, with cropped tops, bias cut jackets, dhoti pants, capris, coat dress, trouser suit, midi/maxi skirts, ‘A’ line midi, bell bottom pants and jacket combo and double breast coat. 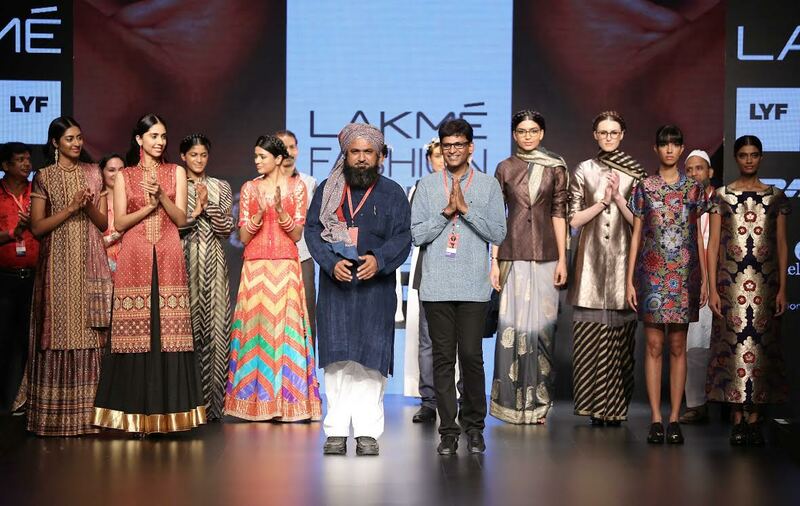 The glory of the leheriya was brought to centre stage under designer Anupama Bose’s skills and Islammuddin Neelgar’s expertise. 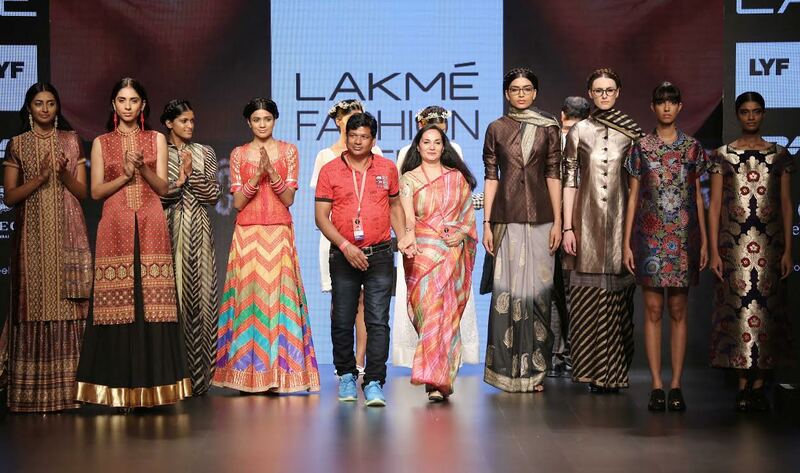 The gorgeous leheriya designs in rainbow hues were turned into stunning ensembles. A ravishing red kaftan, feminine green/blue gown, an electric Anarkali, a variety of saris in multi leheriya and the mind boggling lehenga, choli and dupatta were a perfect offering of memorable ethnic formal wear. Bringing the grandeur of Banaras brocades to the forefront, Hemang Agarwal worked with master weaver Sharfuddin Ansari for his sensational line of Banaras saris teamed with jackets and blouses. The rich hues of Banaras brocades floated vibrantly down the ramp as yellow, blue, grey, black, red, green, bronze and copper came alive on the stripes and floral weaves of the glittering saris and the short and long jackets. Giving the age old Ajrakh technique a contemporary twist, Asif Shaikh worked with master craftsman Jabbar Khatri. Gorgeous formal saris were worn with stylish blouses. Long skirts dazzled with intricate Ajrakh designs, kurtas, anarkalis, palazzos, lehengas, blouses and dupattas, looked stunning in myriad colours and prints. Men’s wear featured kurtas and shawls worn with wide salwars or churidars, which were also in gorgeous Ajrakh hues.